The issue of justification has long been regarded as “the issue on which the church stands or falls.” Indeed it is, for if the church does not properly understand or preach the Gospel of salvation, then she ceases to be a true church. The seventeenth century Reformed theologian, Francis Turretin, combined a love for the Scripture with a gift for precise explanation that few have matched in church history. 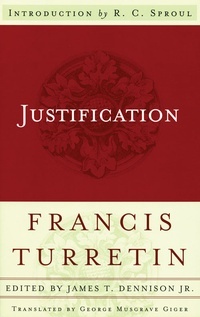 In this volume, taken from his Institutes of Elenctic Theology, Turretin explains and defends the biblical teaching that justification is by faith alone. An introduction to this important work is provided by Dr. R.C. Sproul.